Also note the chains are not on the smallest cassette cog. Even never working in a shop, a pro rider should know better. Unacceptable. Send him to the gulags! He must be re-educated! Not when you’re the “American dream.” Psh. More tragic and heart breaking news, Charlie follows Bridgett Leber on instagram. I for one would like an explanation. Never face the drivetrain towards the stand. But, trust fund kids have never had to turn wrenches. 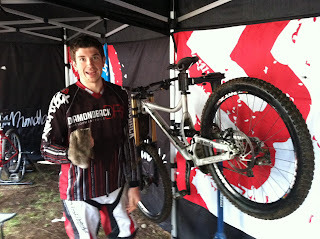 ^ WOW ^ WHOS THAT IDIOT WITH HIS BIKE IN THE STAND WRONG? What’s the policy on using V brakes to save weight? Worked at a “shop”? No, I’ve never considered making 13 bucks an hour to adjust derailleurs on a wal mart bike for 25 hours a week. we were just talking about this at the shop. and i make like atleast 14 cmon bruh. i need to go milan style and become an electrician already. Previous Previous post: Do petitions work?